Korean rolled egg omelette (Gaeran Mari) quick and easy recipe. 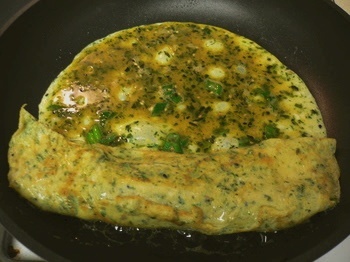 Any type of omelette takes a little patience and a rushed cook ends up with rubbery eggs, so don’t rush it with high heat. Like most Korean dishes, this recipe has many variations. You can use different vegetables, even add in some diced ham, omit the seaweed if you don’t have any. Mix eggs with whisk or fork and add scallion and carrots until well combined. In a lightly greased saute pan, pour egg into hot pan and allow to spread out. As edges and center begin to firm, start lifting and folding egg with spoon or baking spatula (coax egg into a tight roll into several 1.5 inch [approx.] folds). As egg gets firmer, keep folding/rollin g like a jelly roll until completely rolled. Turn off heat and gently flip rolled egg over, then let sit for half minute or so to make sure it is cooked through. Remove to plate and let sit for 3-5 minutes or so. With sharp knife, slice rolled egg into 1/3 inch pieces (cut width-wise, not length wise). Arrange egg slices to look pretty on a plate. Serve with white rice and kimchee! This often appears in many lunch boxes in Korea.